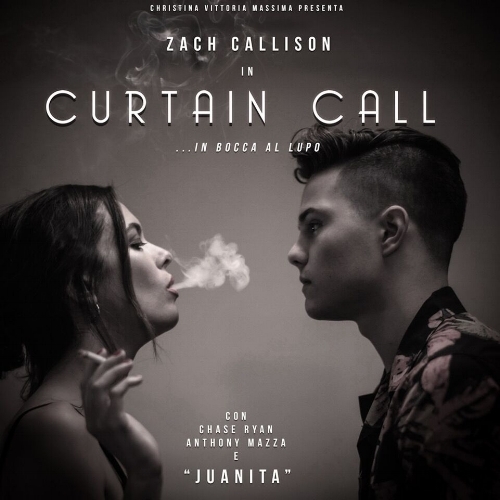 about his latest single, Curtain Call. I ask him about his acting work and how that links with his music; what L.A. is like in terms of its influence and scene; what sort of themes inspired his E.P., A Picture Perfect Hollywood Heartbreak – Callison talks about his plans for the remainder of the year. I ask him whether he’ll be over in the U.K. this year; the new talent we need to keep an eye out for; which artist, given the chance, he would love to support; what advice he would give to new artists emerging; how he spends time away from music – Callison ends the interview with a pretty cool song. Pretty good! It’s been kind of insane lately, but all for good reasons. My name is Zach Callison. I started out and continue to work as an actor and voice actor on shows like Cartoon Network’s Steven Universe and Amazon’s Just Add Magic, and now I’m getting ready to release my first solo music project: A Picture Perfect Hollywood Heartbreak. Tell me about the single, Curtain Call. What is the tale behind the song? It’s really part of a larger tale. The upcoming E.P. is one long, continuous story from cover to cover and Curtain Call plays an integral role in the narrative. It’s a climactic moment where the album’s point of view shatters into two separate voices: one from the past and one to carry into the future. While my first single, War!, is very intentionally the ‘theme song’ of one of these voices; Curtain Call shows one violently interrupted by the other. What can you reveal about your E.P., A Picture Perfect Hollywood Heartbreak? What sort of ideas and sounds has influenced the songwriting? It’s certainly evolved beyond the typical scale of an E.P. since I started writing it…it now includes way more than the original five tracks and has become something of a short, one-act Rock musical. I’ve always been struck by the idea of a single story being told from top to bottom on a tracklist, with each song, lyric, and interlude serving the greater narrative. I believe I’ve been able to accomplish that in my own way; concept and story-based albums are not a new form of storytelling (Kendrick Lamar’s To Pimp A Butterfly is a recent example of it being done spectacularly), but I don’t know of anyone else who has done it the way me and my team have for A Picture Perfect Hollywood Heartbreak. Records almost always have a unified sound that stamps the artist’s signature into the grooves and the whole project unifies under that banner. With my project, I wondered how I could change that norm by creating something that leaves you with one impression of the artist on track-one and takes the listener through a transformation that ends with a completely different impression by the end of the album. I changed tremendously over the course of the past few years since I wrote the first track of A Picture Perfect Hollywood Heartbreak and my goal was to bottle up my coming-of-age story and press it into one, very personal time capsule. I believe we’ve accomplished that. You are an actor and have appeared on several different T.V. shows. Did music come before acting? Do the two link in any way? Music, actually, did come before acting! When I was seven and living in St. Louis, my parents put me into singing lessons because of how much I loved singing at school. I ended up auditioning for a production of The Music Man at the local community college and that ended up being my first acting gig. Eventually, the acting took off, leaving singing and piano as ‘hobbies’ that I did on the side for a while to bolster my résumé. I played in a lot of cover bands and sang for shows like Steven Universe and Sofia the First for years after that - but music as a profession wasn’t a thing for me until the end of 2015 or so. Does your exposure and attention from your T.V. work make you more guarded as a songwriter? How much of your writing is enforced by the way you are watched and viewed by the public? I’d say it makes me bolder, if anything. As an actor, almost 100% of the time I’m working as a mercenary; a hired gun for someone else’s script or project. While that brings me a lot of fulfillment, after a decade of doing nothing but that, I needed something where I could say things I couldn’t project anywhere else. Also, growing up as a child actor, we constantly have people warning us not to ‘go crazy’ or destroy our image by not censoring what we say…it drives you up a wall eventually. I promised myself I wouldn’t censor myself at all on this project, as that would be doing a disservice to myself and my fans. How vital is L.A. and its people? Is it a great place to create and work? Do you remember when music came into your life? Which artists do you count as influences? I can’t really remember because it’s always been in my family and in my surroundings. The furthest back I can recall is watching my dad and uncle play a gig doing Rock covers back in St. Louis at around three-years-old. (I was eating a giant plate of waffle fries…important detail) It wasn’t long before I ended up on stage for the first time at five-years-old performing ‘the worm song’ for a big group of kids while on vacation. Muse are king; they’re my number-one inspiration, always. Twenty One Pilots is solidly in the number-two spot. After that, it’s a total melting pot…I’ll just name-drop ten in no particular order: Led Zeppelin, Stevie Wonder; Hiatus Kaiyote, Kendrick Lamar; Kanye West, Death Grips; Zedd, Frank Ocean; Sturgill Simpson and Rebecca Sugar. (That last one, most of all). Huge announcement on this is coming very soon! Two big L.A. shows and appearances all around North America after that. Stay tuned. Will you come to the U.K. at all? Are you a fan of British music? Muse are my all-time favorite act and one of the biggest inspirations for Curtain Call as well as the rest of the project. I also came up on a healthy diet of '60s/'70s British classics: The Beatles, Led Zeppelin; Eric Clapton and Queen to name-drop. Radiohead, Gorillaz and George Ezra are few others I spotted just now while scrolling through my Spotify library. Harry Styles’ self-titled (album) was a revelation, as well…he’s got the best style of all the 1D guys post-breakup in my opinion. I’ve also got a guilty pleasure-type love for the Grime sound. That’s a great scene right now. In 2018, I want the message of this project to resonate with as many people as possible; whether they be long-time fans or new ones. I want to release more music after this E.P. before the year is out and I’d like to lock-down more acting work this coming episodic or pilot season. I’ve actually been back in acting class getting back to basics for the first time in a hot minute, just to make sure I’m keeping up on that end. Without giving too much detail, I had the honor of being able to bring in someone to work and record on A Picture Perfect Hollywood Heartbreak that is a part of one of my biggest influences and inspirations in all of music. Due to a non-publicity agreement, I can’t name this person, but they know who they are and I can’t thank them enough. It was absolutely surreal for me. I can’t pick any act other than Muse: they truly have one of the best live shows in the world, on a grand scale. Dream arrangement: six continent stadium AND festival tour, full orchestra with brass sections on top of the band and bring out a bunch of awesome guests during the sets. It’s Muse and Zach Callison - so stupidly expensive lighting setups are a must. Remember kids: murder your expectations, not your dreams. Find your community. It is absolutely essential. These past three years of making my first project have been the greatest challenge of my life and I was lucky enough to already have a supportive group of artists around me that I could go to for advice, critique and referrals. You almost always have to have a tribe of people that you make stuff with. Also, don’t order three-and –a-half metric tons of Dom Pérignon from BevMo! Even in bulk, it’ll drive your production costs up substantially. Grandson are making some pretty dope Rock stuff over trap beats up north right now. I highly recommend. It’s all very politically-charged; a direction I see myself moving towards eventually. Shout-out to my homie Jesaiah who did the background vocals for a number of tracks on A Picture Perfect Hollywood Heartbreak and has made some cool tracks as a solo artist. My time away from music is usually spent acting and vice versa…there’s not a lot of spare time these days, which I prefer, but sometimes I have to have to surrender and go watch baseball or meet up with some friends. Technically, it puts me much closer to the music (literally) but I also rave a lot. The SoCal festival scene is tops and I’ve got a great circle of friends in that now too.